The preliminary plans for Sandals Tobago and Beaches Tobago. Jeremy Jones, Sandals Resorts International's corporate services director said the spin-off benefits from the hotels would include other sectors including agriculture, transportation and banking. Incentives are an investment which do not last forever, but which can ultimately lead to economic benefits for the entire hospitality industry in Tobago. This is what Sandals Resorts International (SRI) corporate services director Jeremy Jones wants local stakeholders to bear in mind as the hotel chain negotiates with the TT government to build Sandals and Beaches resorts on the island. 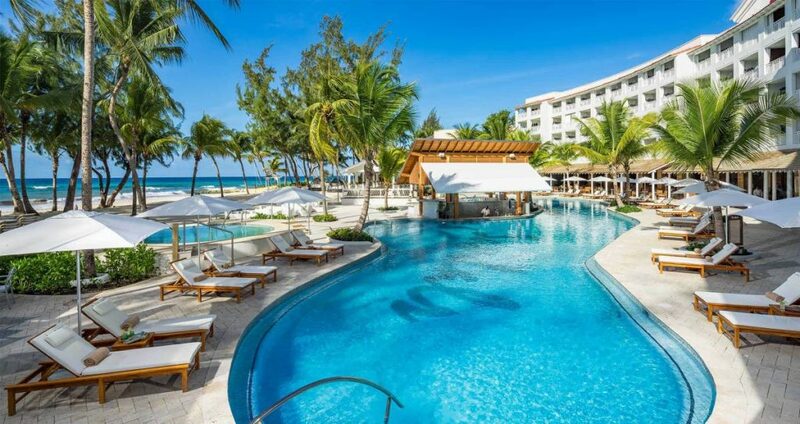 The Sandals resort targets couples only, while Beaches caters to the family – and the project is the largest undertaken by the group in the Caribbean, Jones told reporters at the breath-taking Sandals Royal Barbados resort, St Lawrence, Barbados on October 11. Asked about possible incentives for the resorts, Jones tackled the issue head-on saying while the “conversation” is still ongoing between both parties, the spin-off benefits would also include other sectors such as agriculture, transportation and banking. “We look at the incentives as an investment and they don’t last forever, but at the end of the day, the jobs that come along would lead to economic benefits that come with this. He said some of the factors they are looking at are transit times for goods getting into Tobago and the time it takes to clear ports and customs before making a determination as to what would make the destination profitable. “The hospitality industry in Tobago is under pressure, the occupancy that we see currently in Tobago will not necessarily allow the Tobago hoteliers to pay the bills that they have, some of them mortgages. "In all of the destinations we’ve gone to, we’ve seen that change, as far as we are concerned when the sea rises all the boats float a little bit higher and that’s what we think Sandals brings to the island and to the destination, because it’s not going to be a charity event, we’re doing it to make money for everybody. He said once the negotiation stage is completed there are still several procedures to be completed, such as the advertising of tenders from the various contractors for the project. He said the actual construction phase may last approximately two years as over 2,000 people will be employed on the facility. Asked about the benefits to the local Tobago community, he said spin-off economic activity would increase such as the local farmers, taxi drivers and banks. “The farmers mostly get ahead of the game from the start, first with the clearing of lands, find out what the seasonality of the different crops are and we will provide well beforehand what the consumption is in every aspect of our food and beverage preparation so the farmers can get prepared. Jones said if Tobago farmers are unable to handle the amount of produce required, the resort will have to import the goods to ensure the smooth running of the resort. He noted that close to 90 per cent of all the produce consumed at the Jamaican resort are locally produced. And to reinforce the economic benefits which come with the resort, he recalled a conversation with an employee at the Barbados Sandals who had complained about the shortage of parking spaces. Jones also assured the resort group had "nothing to hide" on its plans for Tobago, in response to chartered surveyor Afra Raymond's efforts to have Government disclose details of the project in a judicial review application of the Freedom of Information Act. Meanwhile, Sandals regional public relations manager Sunil Ramdeen said the resort did not only offer economic benefits to the respective islands but also provided academic qualifications to its employees, and cited the Sandals Corporate University which offers certification and degree programmes in hospitality, training and management programmes. Jones said the Sandals resorts started close to 37 years ago with a single small resort in Montego Bay, Jamaica. He said there are approximately 14,000 people employed across the two brands. Reply to "All about Tobago"